This past weekend I felt like a real legit blogger. You can tell your friends that you blog, you can tell random strangers that complement your jewelry, but sometimes when I say I have a craft blog people just look at me like...oh that's nice. What's a blog? No really. Someone asked me that this week. So, when I had a chance to go to a mini bloggy boot camp hosted by the SITS Girls in Philadelphia, I was SO PUMPED. See, I feel like half of crafty bloggers live out in Utah and the other half live in California or Texas or someplace like that. And that's where all the conferences seem to be as well. The East Coast seems severely unrepresented, and so when I heard this event would be in the closest major city to me, a little bit of dancing ensued. The event was at a super swanky Philadelphia hotel, so of course I had to dress swanky as well. 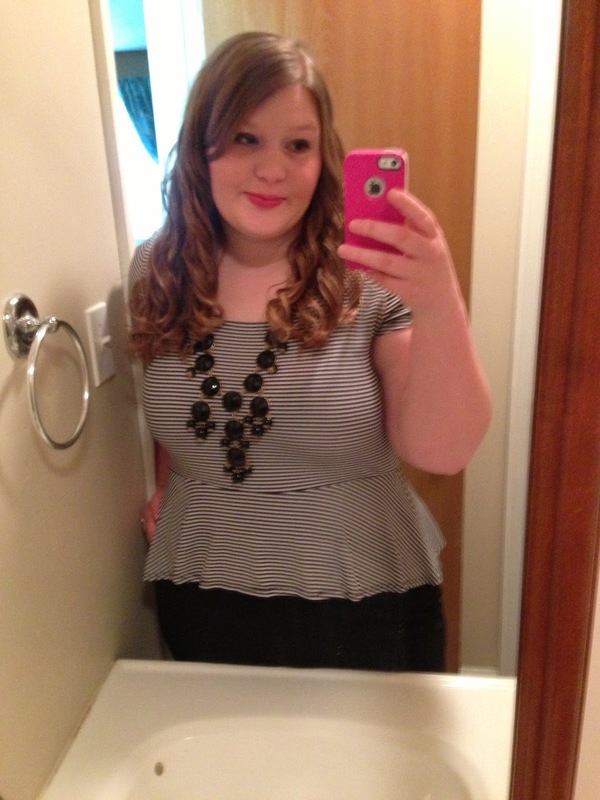 Cute little peplum dress from Ross, curled hair, red lips. I don't even put this much effort into dates with my hubby. Priority problem noted. I first heard about this event from Christina from Christina's Adventures. We actually live really close to each other in real life and had met briefly one time in person before. We decided to venture out of our little suburbs together and make the trek into the big city. Please note: I was the one in charge of getting us to our final destination - and I am like THE WORST at directions. Like, so bad that my parents bought me a GPS before I even had my license because THAT'S how bad they knew I would need one if they ever wanted to see me again. But, thanks to the wonders of google I figured how we could take the train into the city super easy and we made it and we didn't even get lost! About to get off the train - excited to meet up with other bloggers and the stinky homeless men we had been sitting with had already gotten off and we could sit together finally. Yay! 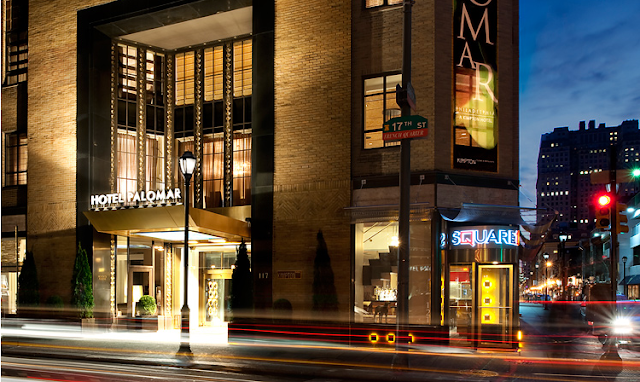 The event was held at Hotel Palomar in center city Philadelphia. (Photo from their website). This place was SUPER fancy and made me feel SUPER important. The event itself was great. The night was sponsored by Invisalign (more on this company later!) and was hosted by the SITS Girls - Tiffany and Fran were awesome! Fran taught a great mini class on SEO and Tiffany did a great session on sponsored posts. It's so nice to hear someone tell you how OK it really is to do sponsored posts. We provide so much free content to our readers - we deserve a little compensation where we can get it! The sessions were great - but this was my creepy excited face for the free wine that was was promised to come later. You know I was all over that business. It was fun to meet some other area bloggers - besides Christina I didn't really know many blogger even remotely close to me. Of course it was great to talk with people who just GET IT - they know what I mean when I talk about the whoas of Pinterest and WHAT AM I GOING TO DO when google reader is finally gone for good. I had a great nigh of networking and chit chatting and it was a great night of confirmation about WHY I blog. Eventually Christina and I had to head back home...but not without a potty break first. Even the bathrooms at this hotel were cool. Here's a selfie I took on the way out...right after I walked into the mens room first by mistake and then SERIOUSLY almost peed myself laughing so hard with Christina when I realized what I had just done. Hi Rebecca! It was great meeting you and Christina at the BBC in Philly. I think I would have been wandering around aimlessly looking for the room if I hadn't bumped it to you guys, haha. It's great to know that there are more bloggers in the area. Before the conference, like you, I felt like there didn't seem to be any bloggers over on the East coast. Either way, I'm glad that I went and that I met some other East Coast bloggers. Hopefully we can all keep in touch! Bloggy Bootcamp is coming to Charlotte this month and I was so disappointed I didn't get in. I do agree though, the west coast get far more representation on the networking front. Hopefully we can change that. I'm anxious to meet so many East coast bloggers! Rebecca, you are so cool on the foto! I like your outfit! You are beautiful!! !